The Government of India earlier stated the fellowships for research scholars would be increased periodically (every four years). IIT-Guwahati research scholars stage demonstration in the campus demanding hike in Fellowship. Image :Northeast Now. 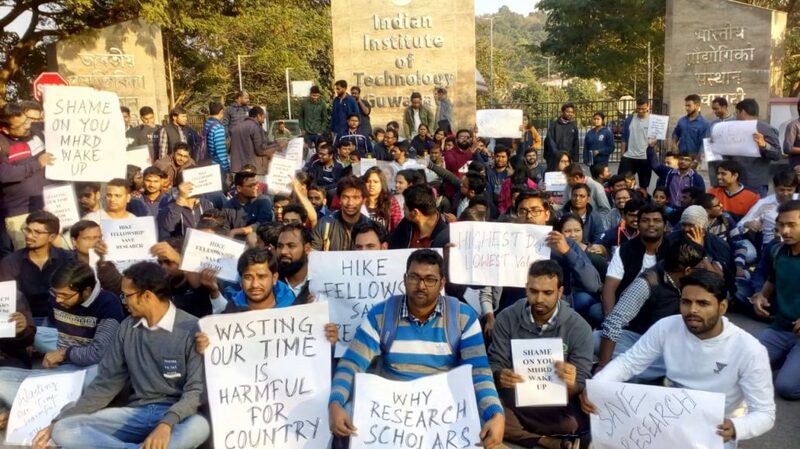 The research scholars of Indian Institute of Technology (IIT) Guwahati who were there in Delhi on January 16, to support the indefinite strike are back at campus. The representatives will share their experiences and also hold a candle march from Central library to the Admin building from 5:00 pm to 7:00 pm on Monday. Around 2000 people will join the protest at the campus on Monday. The scholars at IIT Guwahati continue to support the ongoing agitation demanding hike in fellowship for all research scholars in the country. The researchers across the country continue to protest for the last several months but theCentral Governmentseems to be stringent in giving any positive response. In an earlier meeting held on November 20 last year with Prof. K. Vijay Raghavan, the principal scientific adviser to the Government of India, a petition was submitted for an prompt revision and timely disbursal of scholarships in all the institutes in the country irrespective of the funding agency, informed IIT-G sources. On January 16, 2019, the researchers from all the parts of the nation reached the office premises of the Ministry of Human Resource Development (MHRD) in New Delhi to stage a silent protest for the cause. But the situation turned violent when the research fellow-mates, protesting silently at MHRD, New Delhi were taken away by the police force. The agitating research scholars shouted slogans like ‘MHRD Hai Hai’. The major demands of the reach scholars are – research fellowship should be increased by 80 per cent; fellowships should be hiked with a proper revision in every four years and irrespective of the funding agencies, the fellowships should be disbursed to students in time. The protest rally and meeting are planned to be organised on daily basis, which will for sure have impact on the normal classes running in an institute of repute. The representatives at IIT Guwahati firmly stated that the agitation would continue till the hike in fellowship is confirmed by the Government of India.